Until recently, the New Markets Tax Credit (NMTC) Program was one of several tax credit programs that required annual approval and appropriation through the federal budget process. In December 2015, the situation changed when Congress approved the program for five more years (2015-2019) at an annual appropriation of $3.5 billion. While the program is still not permanent, this extension provides a welcome degree of certainty to the industry. Health centers with capital project plans will have the time to find and secure a site in a qualifying census tract and, if necessary, conduct a multi-year capital campaign with reasonable confidence that the credits will be available when it is ready to begin building. Our latest resource publication, Spotlight on Capital Resources: New Markets Tax Credit Program Extension, is designed to help health centers better understand the extension and its implications. 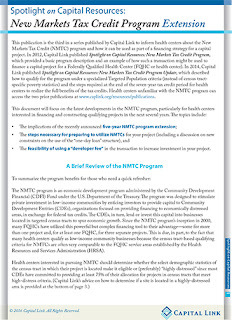 The third in a series of NMTC Program resources published by Capital Link, this resource also describes the steps necessary for preparing to utilize NMTCs for your capital project (including a discussion on new constraints on the use of the “one-day loan” structure) and the feasibility of using a “developer fee” in the transaction to increase investment in your project. To help health centers take advantage of this opportunity, we will also be hosting a webinar, Financing Health Center Projects with New Markets Tax Credits, on Thursday, October 13, 2016, from 2-3 pm ET. This work session will acquaint participants with the benefits provided by using NMTC, how to obtain them, and how to structure and close transactions. We will discuss some near-term opportunities arising from the historically large 2015-2016 allocation round. Register by clicking here.